What caused a recent spat between Ahmadinejad and Khamenei? A long simmering rift between Iranian President Mahmoud Ahmadinejad and Ali Khamenei, the country’s Supreme Leader, has finally boiled over. For the last two weeks, the two leaders have been locked in a public battle over Ahmadinejad’s decision to fire his minister of intelligence, a close ally of Khamenei. And, in spite of indications in the last few days that a compromise has been reached—not to mention Khamenei’s repeated pleas that factional feuds be kept out of the media lest the dispute embolden foes and dishearten friends—acrimonious attacks by both sides have continued apace. Regardless of how the crisis is resolved, one thing is clear: The confrontation marks a splintering of the once healthy alliance between the two leaders—and a serious blow to unity within the Iranian regime. Ahmadinejad and Khamenei have had disagreements over key appointments in the past, but typically they have been waged outside the public eye. The president previously refused, for instance, to comply with Khamenei’s publicly stated wish to dismiss Esfandiar Rahim Mashaei, Ahmadinejad’s chief of staff, all-powerful behind-the-scenes fixer, and his son’s father-in-law to boot. Everything Mashaei did or said—from his talk of “Iranian nationalism,” a concept condemned by many Iranian clerics as a Western colonial trick, to his cavorting with a beautiful actress—became a subject of controversy and backbiting in the media. But Ahmadinejad, in spite of pressure exerted by the Supreme Leader, has never flagged in his support for his beleaguered adviser and relative. Two weeks ago, however, these often whispered tensions broke into the open when Ahmadinejad dismissed his intelligence minister and Khamenei opposed the move in a surprisingly public fashion. Instead of trying to solve the conflict behind closed doors, Khamenei chose to publish a letter—pointedly addressed not to the president, but to the dismissed minister—that reappointed the man to his post. Ahmadinejad, for his part, maintained a studied silence, but he refused to attend cabinet meetings and his website continued to carry the news of his intelligence minister’s dismissal. Finally, on Monday, he agreed to attend a cabinet meeting, but the controversial minister of intelligence was absent and his fate is still not clear. In addition, Ahmadienjad’s announcement that he had reconciled with Khamenei has itself become the focus of a new round of controversy. After comparing his relationship with the Supreme Leader to that of a son and his father, Ahmadinejad has been lambasted by conservative clergy members loyal to Khamanei. The relationship isn’t filial, Khamenei’s representative to the Revolutionary Guards charged, but rather that of an “Imam and Mamoum”—a divinely guided leader and a submissive believer who is led in all matters and at all times. Another cleric declared that refusing to heed Khamenei’s voice is heresy against god himself. 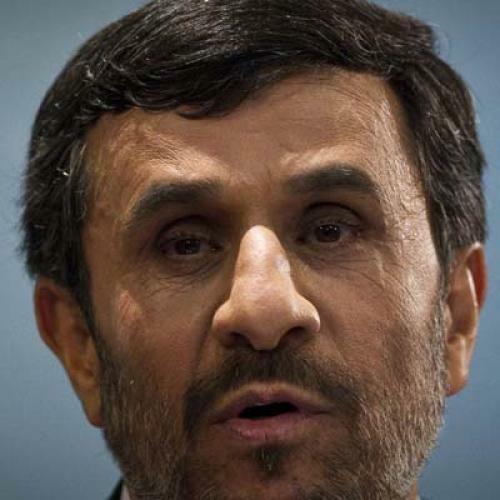 While the facts of the on-going confrontation are more or less clear, the important question is why Ahmadinejad, who began his first term as president by kissing Khamenei’s hand on the day of his inauguration, is now biting the very same hand that was certainly critical in giving him his alleged victory in the contested June 2009 election. According to one theory, Ahmadinejad knows the clergy are increasingly reviled in Iran and is keen on either challenging them or at least distancing himself from them. Others attribute his defiance to the arrogance of power, his tendency to believe in his own lies, and his belief that he, in fact, did win the last election and thus need not play vassal to a weakened Khamenei. Needless to say, the conservative clergy attribute the whole crisis to an Israeli and American conspiracy and claim that “infiltrators” from the ranks of the enemy have bedeviled the gullible president. Why Khamenei has decided to pick a public fight at this time is no less important to ponder. It appears that, once again, he has chosen a path whose goal is nothing more than establishing and expanding his own authoritarian power—the outcome of which will likely leave the regime fractured and weakened, his power utterly dependent on the whim of the Revolutionary Guards. His rash decision has left him with no good outcome: He must either cave and allow Ahmadinejad to fire the minister—and suffer yet another major blow to his authority—or he can succeed in humiliating Ahmadinejad, creating considerable resentment amongst his base of mainly poor, rural supporters. A third possibility, however, is that Khamenei and his allies might have chosen this public row as an excuse to offer up Ahmadinejad as a sacrifice and blame him for the country’s impending financial woes. By all accounts, the country’s economic horizon looks bleak. (The only good news has been the price of oil.) Many seasoned economists, including several in key positions in the government, admit that the Iranian economy is heading towards a dangerous moment of hyper-inflation and depression-like unemployment rates. With the economy in rapid decline, the search for a scapegoat will likely intensify. The only thing that’s uncertain at this point is who will take the fall.